With the ArcGIS Desktop mapping software you can create intelligent, dynamic maps using data from a wide range of sources. ArcGIS Desktop includes tools and data you can use immediately to perform state-of-the-art GIS analysis and map creation. There is a vast difference between visualizing data in a table of rows and columns and seeing it presented in the form of a map. 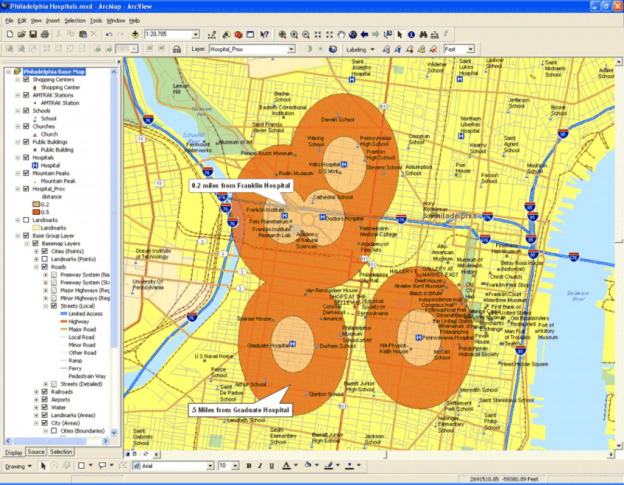 ArcGIS Desktop provides the most complete set of options for creating production quality maps including intuitive map composition tools and wizards; a wide range of cartographic capabilities such as color and pattern palettes, symbols, fonts, layout templates, and advanced labeling and text placement tools; and extensive report creation options. With ArcGIS Desktop you can also visualize data in the form of charts and reports, in 3D, and over time. Data management is a key aspect of any GIS project. ArcGIS Desktop includes a number of tools for geographic, tabular, and metadata management, creation, and organization. ArcGIS Desktop supports a wide variety of data types including demographics, facilities, CAD drawings, imagery, Web services, and multimedia. You can directly read or import more than 70 different formats in ArcGIS Desktop . You can also search for data in other locations through database and server connections. Geoprocessing (geographic processing or analysis) is one of the fundamental capabilities of any GIS software. ArcGIS Desktop includes hundreds of tools that perform spatial analysis and geoprocessing tasks including common GIS operations such as overlay, buffer, and data conversion. The geoprocessing framework in ArcGIS Desktop allows you to easily run processes using wizards or interactively build models that link processes and data sets together using ModelBuilder. Why Use ArcGIS Desktop software? Most data has a geographical component that can be tied to a place: an address, postal code, global positioning system location, census block, city, region, country, or other location. ArcGIS Desktop lets you visualize, explore, and analyze geographical data, revealing patterns, relationships, and trends that are not readily apparent, in databases, spreadsheets, or statistical packages. What is the best way to respond to a power outage? Which commercial zones are close to schools? What taxes are due for a land parcel? ArcGIS Desktop software has the largest range of functionality available in any desktop GIS mapping system. Built with an intuitive Windows-based graphical user interface, ArcGIS Desktop is simple, easy-to-use, and includes exceptional online help and extensive documentation. Instructor-led training, Internet-based courses, and an array of books are also available to ensure you are successful with ArcGIS Desktop . Throughout the world, ArcGIS Desktop is the most widely used GIS in schools, colleges, and universities.